The President’s Office and Academic Senate have partnered together to honor outstanding students for excellence in the classroom, campus community, or in their personal lives. 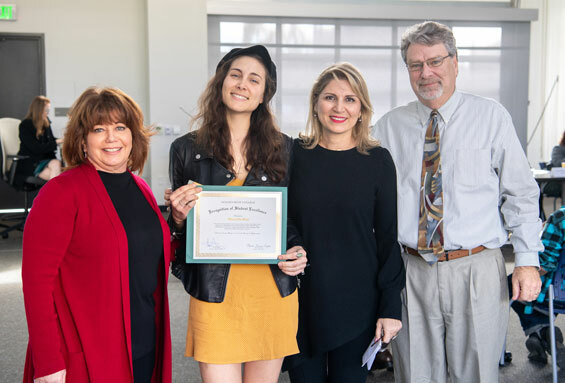 Mariella was nominated by Mathematics instructor, Maryam Khakbazan and honored at the Planning and Budget meeting on February 27th by Academic Senate President, Martie Ramm Engle and GWC President, Tim McGrath. We appreciate the support of our faculty members who have submitted such wonderful nominations on behalf of their students. The nomination period is ongoing so faculty may submit a nomination whenever you find that special student who is deserving of recognition! Nomination Form [click here]. GWC Floral Design Students have repeatedly won the top three awards at the Floral Design Competition at the Orange County Fair.